We continue our annual Blues Bytes tradition for the January Pick Hit by listing our reviewers' top ten hits from last year. Curtis Salgado's Soul Shot and Michael Burks' Show of Strength are two CDs that show up on multiple lists. 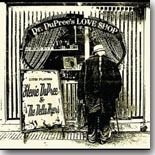 Our reviewer called Dr. Dupree's Love Shop, from Stevie Dupree & The Delta Flyers, an example of "southern-fried blues," which should pique everyone's interest. It's this month's Surprise pick. This month's Flashback feature looks back at an earlier album, Club Caravan, from Mississippi Delta blues veteran Big George Brock. Our What's New section features new releases from Magic Slim & The Teardrops, Buddy Guy, Colin Linden, Gary Clark Jr, Tim Lothar, Red Lotus Revue, Scott Ramminger, Dave Widow, and more.